For today’s maintenance teams, going mobile is an absolute must. 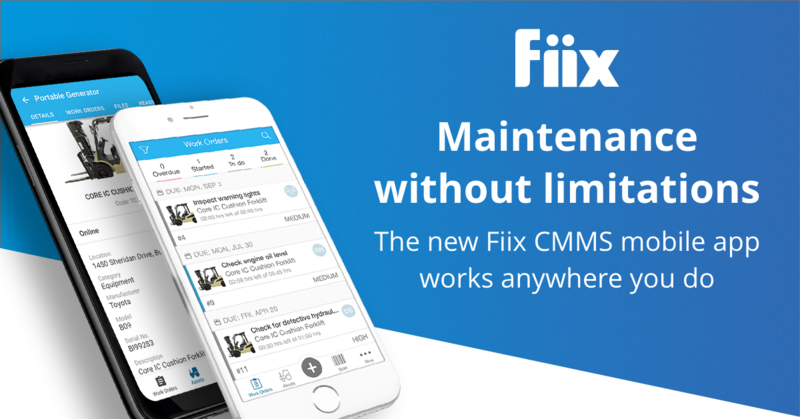 Not only does a mobile CMMS app make maintenance scheduling, work order tracking, and spare parts tracking easier, but it also completely transforms the way maintenance teams are able to interact with CMMS software. A good mobile app will allow teams to react faster to emergencies, spend less time logging work, and remove all barriers to tracking work in the field properly. That’s why we’re so excited to announce that our brand new mobile app that you’ve been asking for is now available on the App Store and Google Play. Wait—doesn’t Fiix already have an app? Yes! We’ve had a mobile app available for our customers for some time now. But in order for us to deliver all the great customer-centric features that we’ve been asked for, we needed to build something a little different. That’s why you’ll need to download this app even if you have the old one. Don’t worry, even if you use both apps for a while, all the work that’s completed in either app will be captured by your CMMS (that’s the beauty of a cloud-based CMMS). Got it. So what’s different about this one? Lots, actually! It’s probably more helpful if we list it out for you. No internet connection? No problem. The new Fiix app lets you work uninterrupted under any circumstances. Changes made in offline mode are synced once you are back online. App users now have a completely personalized experience from the moment they sign in, meaning they’ll see the information that’s relevant to them without having to go digging. Work orders are now listed by due date and assignee for easy management. Creating a work order from anywhere is easier than ever. Users can now select an assignee, select a due date, and add tasks, so that everyone can get the real-time updates they need to get the work done. Admins can now edit the status of work orders and work requests, add a due date to a work request, and add tasks to a work request, and assign them to technicians. If you’re sensing a theme here, it’s because there is one. This app was built to allow teams to work without limitations, in every sense of the word. Great question! After you download the new app and familiarize yourself with the interface, you can submit any suggestions or feedback by selecting “Fiix chat” after you navigate to “More” in the bottom nav of the home screen. You can also reach out directly to your customer success manager with your feedback. Where can I find more information about the new Fiix mobile app? That’s easy— just head over to our mobile CMMS page for a rundown of new features, more screenshots, and frequently asked questions. Ready to get started? Download the app on the App Store or Google Play today, or book a demo with a mobile CMMS expert.